Hello friends! Today I have a Mini Everyday Messages Little Mermaiden Agenda underwater scene card to share with you! I'm pairing the brand new Mini Everyday Messages Stamp Set and Little Mermaiden Agenda Stamp Set and coordinating dies with the previously released Circular Grid Cover for a fun filled card! Don't miss a single newsletter! Sign up now! The Circular Grid Cover was die cut from smooth white cardstock. The die cut panel and a 4 1/4" x 5 1/2" piece of smooth white cardstock were inked with Shaded Lilac, Salty Ocean, Blueprint Sketch, and Black Soot Distress Oxide Inks. Both panels were spritzed with water from a Distress Sprayer and blotted dry. A Honey Bee Stamps Ocean Scene Builder Stencil and white pigment ink were used to add rays of light filtering through the underwater scene. The stenciling was added to both the background and frame. Once the background was completely dry, Mini Everyday Messages were stamped in four of the frame openings using clear embossing ink and heat embossed with white embossing powder. The frame was then popped up with foam adhesive over the background. The images were die cut with the coordinating Little Mermaiden Agenda Dies and adhered to the card with foam adhesive squares. The fish were glued directly to the card. The design was finished with a scattering of Honey Bee Stamps Crystal Clear hearts. Nuvo Crystal Drops were added to the hearts and bikini tops. A black gel pen and fine detail pen were used for the eyes and eyelashes. A stardust glitter pen was used for the mermaid tails. Hello friends! I hope you're all having a fantastic day! Today I have two cards created with the May 2019 Simon Says Stamp Card Kit! You can pick up the May 2019 card kit HERE for just $34.99 + shipping. Or if you’d like to receive this kit and future kits for only $29.99 + shipping per month, you can SUBSCRIBE HERE. When you subscribe you will receive kits delivered to your door automatically. These beautiful, shimmery, pearlescent backgrounds are the perfect backdrop to the gorgeous florals from the Delicate Flowers Stamp Set, colored with no-line coloring and Zig Clean Color Real Brush Markers. The Silver Sparkle Alcohol Ink Paper from the May Kit were inked with Blending Solution, Intrigue, Sublime, and Tranquil alcohol inks. An airbrush tool was used to help move the inks around. The backgrounds were trimmed at an angle, leaving a strip between the two panels. Sentiments from the Delicate Flowers Stamp Set were stamped on white cardstock with black ink. The alcohol inked backgrounds were popped up with foam adhesive for a bit of dimension. Flowers and leaves from the Delicate Flowers Stamp Set were stamped on Bristol Smooth Cardstock with Inkon3 Fadeout No Line Coloring Ink and colored with Zig Clean Color Real Brush Markers. The images were fussy cut and adhered to the card bases as shown. Each card was finished with a scattering of Pretty Pink Posh White Jewels to an additional touch of sparkle. Hello friends! Today I'm sharing this tri window designed card featuring the brand new Big News Stamp Set and coordinating dies paired with some favorite previously released Mama Elephant Stamps and Dies: Stackable Cuties (sitting elephant and bear), The Cat's Meow (sign and mouse), and The Bunny's Hop (bunny head and large flower). The Tri Window frame was die cut from smooth white cardstock. The "inside" rectangles were inked with Cracked Pistachio, Spun Sugar, and Picked Raspberry Distress Inks. These rectangles were adhered directly to a card base and the frame was adhered to the card with foam adhesive strips. The signs in the Big News images were stamped with sentiments from the stamp set using clear embossing ink and heat embossed with white embossing powder. The images were die cut with the coordinating Big New Dies, The Cat's Meow Dies, The Bunny's Hop Dies, and Stackable Cuties Dies before being adhered to the frame design with either foam adhesive squares or liquid adhesive. Welcome to the Honey Bee Stamp Happy 4th BEEday Release Blog Hop Day 1! Today I have a Chicken Coop shaped card to share with you featuring the brand new Chicken Coop Dies, Spring Chicks Stamp Set and coordinating dies, and Eggcellent Sentiments Stamp Set! I created my own shaped card base using the chicken coop as a template and added a sentiment in the form of a sign on the coop and an additional sentiment on the inside of the card to round out this fun and playful design. Everyone has those days where we want to say "cluck it", right?!!! Ha! The 4th BEEday Release from Honey Bee Stamps is HUGE! I've linked to all the products in the release, including 6x6 patterned paper in the shopping list below. While I'm only using a fraction of the incredible products newly released in my project today, I'll be sharing many more over the next few weeks. Be sure to tell me what you want to see me use first in the comments section! Don't miss a single newsletter! Subscribe now! The Chicken Coop was die cut from white woodgrain cardstock and inked with Lawn Fawn Doe and Walnut Inks using the Picket Fence Life Changing Blending Brushes. I die cut the chicken coop twice more from smooth white cardstock. Using one of the chicken coops as a template, I traced the design on a folded side fold card base and cut out the shape with scissors to make the shaped card base. The two white layers of the Chicken Coop were adhered to the shaped card base and the layers were finished with the woodgrain layer. A roof for the chicken coop was die cut from Hero Hues Cranberry Cardstock and adhered to the top of the coop. Honey Bee Stamps Candy Hearts in Be Mine were adhered to the roof for decoration. The hay in the chicken coop was die cut from Lawn Fawn No. 2 Pencil Cardstock and inked with No. 2 Pencil Ink before being adhered to the chicken coop with foam adhesive squares. A "sign" for the chicken coop was created by stamping a sentiment from the Eggcelent Sentiments Stamp Set on Hero Hues Black Licorice Cardstock with clear embossing ink and heat embossed with white embossing powder. The sign was trimmed into a rectangle and adhered to the top of the coop. Images from the Spring Chicks Stamp Set were stamped on Bristol Smooth Cardstock with Inkon3 Fadeout Ink and colored in with Zig Clean Color Real Brush Markers before being die cut with the coordinating dies. The images were adhered to the chicken coop as shown. To finish the card I stamped an additional sentiment from the Eggcelent Sentiments Stamp Set inside the card with black ink. Click the links below to shop the latest HBS Release at Simon Says Stamp (SSS) or Honey Bee Stamps (HBS). Affiliate links used. Your next stop on the hop is the incredible Carol Hintermeier! Surprise! Simon Says Stamp just rolled out a Mother's Day Limited Edition Card Kit! Today I'm sharing a couple of stenciled muslin gift bags perfect for small gift giving packaging and a fur baby card critter for all those kitty mamas out there. There's a little something for everyone in this kit and the For All Moms Stamp Set is great for all kinds of mamas! I love kits like this! For the muslin bags I placed some leftover plastic packaging inside each bag and then stenciled the Bouquet of Roses stencil on two of the bags with the Nuvo Pink Oval Glimmer Paste (included in the kit). Once the Glimmer Paste dried, I lined the cleaned stencil back over the design and stenciled the leaves with Green Apple Dye Ink using a blending brush. Sentiments from the For All Moms Stamp Set were stamped on the bag with black dye ink. The string from the muslin bags was removed and some of the ribbon from the kit was threaded through with a safety pin for a pretty decorative touch that ties into the black stamped text. An acrylic heart from my stash was hot glued in place on each bag. For my second card, I stamped the cat, butterfly, and paw print from the For All Moms Stamp Set on smooth white cardstock using black ink. Some of the sentiments from the stamp set were stamped with Soft Navy and Caribbean Blue dye inks. The images were colored in with Copic Markers and only the tail was cut with a craft knife. Striped patterned paper and Soft Navy cardstock from the kit was trimmed and adhered along the bottom edge of the panel as shown. The tail was put on top to make it look like the cat was sitting on a "ledge". Glossy Accents was used over the nose, heart, paw print, and butterfly body. White and black pens were used to adding extra detail to the images. Hello friends! With the last several releases from Simon Says Stamp I have especially been drawn to the gorgeous Outline Floral dies. A few weeks ago I created an Easter card with the Outline Floral Cross from the Fresh Bloom Release. Instead of sharing right away, I held onto the card with the intention of using the Outline Floral Frame from the DieCember 2018 Release. Imagine my delight when I saw the Outline Floral Mom die in the Blossoms and Butterflies Release! Today I'm going to share three different cards with the same technique! With Easter this coming weekend, I am super excited to share this Outline Floral Cross from the Fresh Bloom Release. The background of the design was created with the MFT Radiating Rays Stencil, Lawn Fawn Lemonade and Butter inks. The Outline Floral Cross was die cut from smooth white cardstock and adhered to the center of the design. The cross was cut out again from multiple colors of cardstock and inlaid into the design. I die cut the cross two more times from smooth white cardstock and adhered them one on top of another on the first cross to really "frame up" the inlay design. A sentiment from the Tiny Words Faith Stamp Set was stamped below the cross with Simon Says Stamp Smoke Ink and the design was finished with a scattering of Nuvo Crystal Drops in Dandelion Yellow and Limoncello. For this next card I'm using this Outline Floral Frame from the DieCember 2018 Release. On some Lawn Fawn Blue Jay cardstock I stamped sentiments from the Tiny Words Encouragement Stamp Set with clear embossing ink and heat embossed with white embossing powder. The Outline Floral Frame was die cut from smooth white cardstock and adhered over the stamped background. The die was cut again from greens, blues, and purple cardstock and the design was inlaid into the frame. The frame was die cut twice more, adhered one on top of another and finished with Nuvo Crystal Drops in Bottle Green in the center of the flowers. The I Adore You was die cut from Orchid Glitter Cardstock and adhered between the two stamped and embossed sentiments. My final card share today features the Outline Floral Mom die from the Blossoms and Butterflies Release. I used the new Mesh Stencil, Simon Says Stamp Olive Green Ink, and a blending brush to created a fun inked background on smooth white cardstock. The Outline Floral Mom die was die cut from smooth white cardstock and adhered to the center of the stenciled design. The flowers, leaves, and "mom" were inlaid with plums, pinks, and green cardstocks. The frame was die cut twice more from smooth white cardstock and adhered one on top of another to finish the large die cut design. A sentiment from the Tiny Words Encouragement Stamp Set was stamped on Hero Hues Palm Cardstock with clear embossing ink, heat embossed with white embossing powder, trimmed into a thin strip and adhered to the card as shown. The design was finished with a scattering of Nuvo Crystal Drops in Bottle Green and White Blizzard. Welcome to the Mama Elephant April Stampede Blog Hop! Today I'm sharing a birthday card created with the brand new Big Scripty Hello Creative Cuts Die and Big News Stamp Set and coordinating dies. The previously released Birthday Messages Stamp Set, Cloud Nine background die, and Sweet Feline sentiment strips round out this bright and colorful design. The sentiments take center stage on this fun birthday design but the background needed a bit of interest to help the sentiments and images shine! A background panel was die cut from smooth white cardstock using the Cloud Nine Creative Cuts background die. The panel was inked with Tumbled Glass and Broken China Distress Oxide Inks, spritzed with water from a Distress Sprayer, and then blotted dry. Strips of cardstock in Hero Hues Azalea, Hero Hues Papaya, Gina K Dandelion, Hero Hues Kiwi, Hero Hues Paradise, and Hero Hues Amethyst were die cut into varying widths and adhered to a regular piece of printer paper (trimmed to 3" x 5 1/2"). I added a strong adhesive to the printer paper and then adhered the strips at a diagonal to create my own rainbow patterned background. I used printer paper because it's thin and will die cut better than another piece of cardstock under the cardstock strips. The Big Scripty Hello was die cut from the rainbow strip background. The Big Scripty Hello was die cut two more times and the dies were adhered one on top of another for a bit of dimension before being secured to the background as shown. The images were adhered to the design with foam adhesive. Sentiments from the Birthday Messages Stamp Set were stamped on the Hero Hues Azalea, Papaya, and Amethyst cardstock with clear embossing ink, heat embossed with white embossing powder, and die cut into strips with a Sweet Feline Creative Cuts die. The phrases were adhered to the design with foam adhesive strips. The card was finished with a scattering of Nuvo Crystal Drops in Carnation Pink, Ripened Pumpkin, Dandelion Yellow, Apple Green, Caribbean Ocean, and Crushed Grape. Welcome to the Simon Says Stamp Blossoms and Butterflies Release Blog Hop Day 1! Today I'm sharing this almost one layer Wake Up and Makeup card features all these amazing images, colored with Copic Markers, details added with a white pen and Glossy Accents, and then stamped over with the Sketchy Lines Background. A small stamped sentiment phrase and gemstones take this one layer design and add a touch of dimension and sparkle! Be sure to check out the entire Blossoms and Butterflies Release HERE and subscribe to my blog (link below video) to never miss a project, including more cards created with products from this release, and newsletter only information (I have a new email feature starting Sunday)! Subscribe to my newsletter and never miss a project! Details were added to the images with a white pen and Glossy Accents. A black glaze pen was used for the mascara wand to make it stand out more. The Sketchy Lines Background was stamped over the entire panel using second generation stamping with Simon Says Stamp Smoke Ink. Shading was added with the same ink around the edges of the panel with a Life Changing Blending Brush. An additional sentiment from the Wake Up and Make Up Stamp Set was stamped on Schoolhouse Red Cardstock using clear embossing ink, heat embossed with white embossing powder, trimmed into a thin strip, and adhered below the other greeting with foam adhesive. Buttons Galore Red Hearts and Pretty Pink Posh White Jewels were scattered throughout the background to complete the design. Nichol Spohr <--- you are here. Use the code BLSM999 for a free jar of Unicorn Dust Glitter (while supplies last!) with any purchase. The code will expire Sunday, 4/14 at 11:59 pm EDT. This is day one of our two-day blog hop extravaganza, so be sure to come back for day two on Saturday. Hello die cutters! Today I'm sharing a card featuring the April 2019 Spellbinders Small Die of the Month Club Kit Dies! This month's Layered Colorful Blooms small die set is perfect for making cards, decor, and more. I hope this jump starts your creativity with this month's kit! Exclusive Set of Small Versatile Dies that cut, emboss, deboss and stencil. Size is similar to Die D-Lites. Cost of the club kit is $12.50 plus shipping each month. For the background of the card I ran a 4 1/4" x 5 1/2" piece of smooth white cardstock through the Spellbinders Platinum Die Cutting Machine using the FSJ Love Stripes Embossing Folder. The April 2019 Small Die of the Month Club Kit dies, Layered Colorful Blooms were die cut from multiple cardstock colors and assembled as shown. The florals and leaves were grouped together in a larger collage near the bottom, and a smaller grouping along the top of the design. The "hello" sentiment from the set was die cut three times, adhered one on top of another and adhered to the design as shown. A sentiment from the FSJ Text Happy Stamp Set was stamped on FSJ Rock Candy Cardstock with clear embossing ink and heat embossed with white embossing powder. 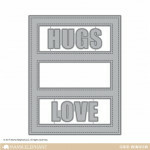 The sentiment was trimmed into a thin strip and adhered below "hello" with a foam adhesive strip. The design was finished with a scattering of Nuvo Crystal Drops. Hi friends! I am absolutely loving the exclusive kits from Spellbinders for April 2019! Today I'm going to showcase the incredible Glimmer Hot Foil Kit of the Month, Classic Alphabet. This is the quintessential classic alphabet that is great for all kinds of amazing projects. I am creating an elegant wedding design with the alphabet and ampersand from the kit and embellishing with die cut florals using the Small Die of the Month Club Kit, Layered Colorful Blooms. 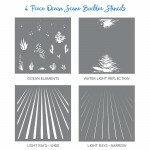 For $20/month + shipping you will receive exclusive glimmer plate set + a foil roll (a $28 value!!!). Join Now and Save 10% Off the purchase of the Glimmer Hot Foil System! *You may add the system at time of subscription. A Exclusive Glimmer Hot Foil Plate Set + Foil Roll that can be used to create Glimmering hot foil projects. $28 Value! I love classic products like these Classic Alphabet Glimmer Plates as they can truly be used in so many ways. I'll be sharing more of these with my Large Die of the Month Club Kit video, too, to show even more possibilities. To help me line up the alphabet on my Glimmer Hot Foil System platform, I masked off a 4 1/4" x 5 1/2 area with post it tape so I could see exactly the area I needed to fill. I used the dies from the Small Die of the Month Club Kit, Layered Colorful Blooms dies and the masking tape to help me line it all up. Then I hot foiled the Classic Alphabet on the FSJ Huckleberry Fusion cardstock background with the Silver Matte Foil (comes with this month's kit). After the large sentiment was foiled, I stamped sentiments from the Simon Says Stamp Tiny Words Stamp Set above and below the foiled greeting with clear embossing ink and heat embossed with silver embossing powder. I trimmed the background down 1/8" inch on one long side and one short side to even up the sentiment just a bit. This will also give the panel a thin white border all the way around that ties into the white blooms of the design. Florals from the Small Die of the Month Club Kit, Layered Colorful Blooms were die cut from FSJ Lemongrass, Limeade Splash, Pool Play, Whip Cream, Banana Cream, and Silver Foil Cardstock (from the April 2019 Card Kit of the Month) were die cut and assembled above and below the sentiments as shown. The design was finished with a scattering of Pretty Pink Posh White Jewels and matted on a white top fold card base.